Welcome to Izzie's Guild Tutorial! Here you can find advice for when you start a guild, or maybe even a way to improve the guild you're already in and love. If you have any questions at all or just need help, feel free to neomail me! I can't stress this enough! Reached 1000 views on 6/13/2013! Reached 2000 views on 11/24/2015! This page covers many topics. They are all listed below for your convenience. Guild Pages (#Pages): What types of pages guilds have, including a few examples. Recruiting (#Recruiting): Everything you need to know about recruiting members... And how to keep them. Activities (#Activities): Different activities you can have in your guild, and how to keep them up-to-date. Advanced (#Advanced): Advanced tips on running your guild. Sitely (#Sitely): Information about IGT. Can you think of a page that should be here? Please neomail Izzie! Take a look at a few guilds. This lets you know what sort of activities and ideas the guilds that are currently active have. Here's a good place to find currently active guilds. Get comfortable with the Guild Chat. As a dedicated guild owner, you will be spending a lot of time there! Different people want different things, right? The same thing goes with Neopians and guilds. -Activity: Members don't want to be stuck in a dead guild with no one posting on the boards! Keep your members chatting on the boards by chatting with them. Talk about your goals, what you're going to buy when you get 1 million neopoints, or even what you had for lunch. -Accessibility: People want to be able to get where they're going as quickly as possible. Making links easy to find is a big part of this section. -Flexibility: If a member is on vacation and can't come to the computer, they don't want to come back from a great week to be guildless. Give members some leniency and don't require too many things of them at once. -Attractiveness: No matter what people say, first impressions do matter. If your layout is lame, people aren't going to want to join your guild. If you wish to read more on this topic, click this link. Every guild starts out with an idea! Figure out what the theme for your guild will be. Roleplaying, neo-related, and guilds relating to books and tv shows are all popular guild themes. Your theme should be something you enjoy. You're unique, and so is your guild. Flaunt your differences! A lot of successful guilds have one-word names, like 'Luminosity', 'Kinetic', or 'Majestic'. The name doesn't actually have to have anything to do with your guild, but it might confuse people if it doesn't! Some guild have names with two or three words, and that's cool too! If your guild has a multiple word name, you can shorten it in advertising. For instance, I shorten "Izzie's Guild Tutorial" to just "IGT" when I talk about it. That saves space in my posts, which makes room for more important info. 1.) It's hard to type a name out if it has symbols. 2.) A name looks sloppy with weird capitalization. 3.) Extra punctuation mark(s) make your guild look unprofessional, and make you look inexperienced. 4.) It's hard to remember which letters are repeated, and how many times they are repeated. 5.) When you say "____ Fans Unite" you sound just like every other, boring old guild. You want your guild to sound new and exciting to get members! Starting a guild is easier with co-owners; it generally gets off the ground faster, and lasts longer, as it has committed members from the start. c: Guilds starting with one person rarely ever succeed. Having a co-owner will lighten your load as an owner. You can dole out responsibilities and not have to do everything by yourself. They can host pages for the guild and you won't have to worry about them leaving the guild. Once you have an idea and a name, you need to find a layout. Your guild will look more established if you have a custom layout, but it is not required. If you ask around on either the Guild Chat or the Help Chat, someone can direct you to either a) a site with premade layouts or b) a person that could make you a layout. Guilds: The real guild navigation and welcome sections must be visible. You may cover everything else with graphics, but if you do, the yellow bar links MUST exist somewhere else on the page so that people can navigate away from your guild. I asked around on the guild boards for what people liked in their ideal guild. These are a few of the responses I got, straight from the mouths (er, keyboards) of your average Neopians. Nice people, regular posting on the message boards. Hopefully some guild avatar lending items that are a bit expensive for average Neopian. In a guild layout I like a nice, clean, quick-to-load front page... NOT graphic heavy... with easy to see/follow links to anywhere else such as the item/pet lending page. A guild that doesn't mind my reclusive tendencies - I don't want to particpate in contests, I don't want to have to post messages to be counted as 'active', but still offers a little bit of everything for everybody. Organization and healthy chat boards. Kind people, plenty of activites, regular guild updates, regular posting, a good guild owner, new guild layouts weekly/monthly, etc. I just want someone to chat with on the message boards. I look for a clean font on the advertiser. Friendly, active, literate, and a clean, professional, organized layout. Why do I need different pages? Different pages are a necessity for a guild. If you cram everything onto your guild homepage, you're going to have quite a few problems! Firstly, you'll run out of room to type up content. Secondly, your page will look crowded, and we don't want that! The next few paragraphs will be telling you what pages to use and what they are. A webbie is also called a "Web" for short, and sometimes shortened is to W when advertising. A webbie tells all of the information about the guild that prospective or new members would need to know. 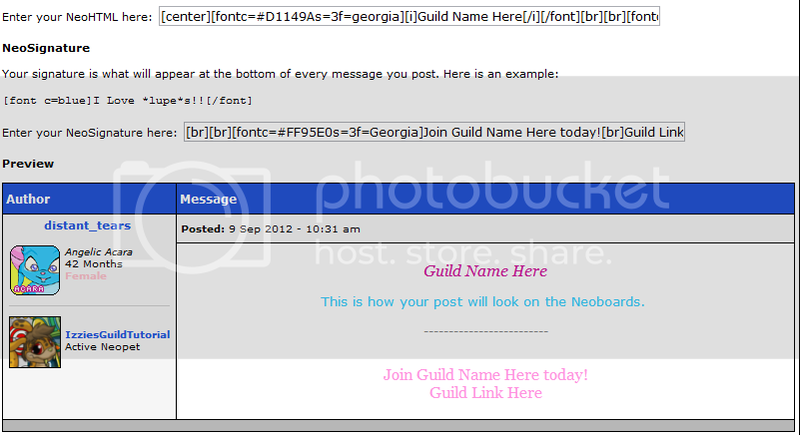 The first paragraph on your webbie should cover all of the basics on your guild. What is your theme? How long has your guild been active? How often do your members post, and at what time are they most active? Your webbie should also include a list of rules, links to important pages (like your guild homepage and portal), the ranks in your guild, and how to achieve them. Note: It's always important to always use correct grammar and spelling when you are writing information that many people will be looking at! A portal is a list of every link that your guild has to offer. It lists links such as: Guild Homepage, Webbie, Activities, Adoption Center, and anything else your guild has! It's important to have some sort of organization system to your portal. I would suggest alphabetical, with links to your homepage and webbie at the top of the list. 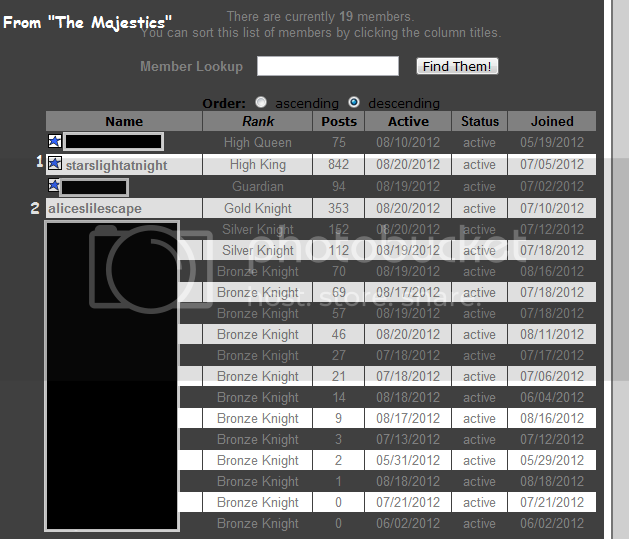 If your guild has a ton of pages, a ton meaning over 30, you may want to consider an anchored petpage for your portal. An activities page is a list of activities your guild has to offer. It can include an individual or team point system, different games, and a list of times when guild auctions or trades will be held. An activities page would not be needed if your guild is a roleplay guild or chat-based. Not sure how to make a pet page? Click here! Well, you're on one right now! 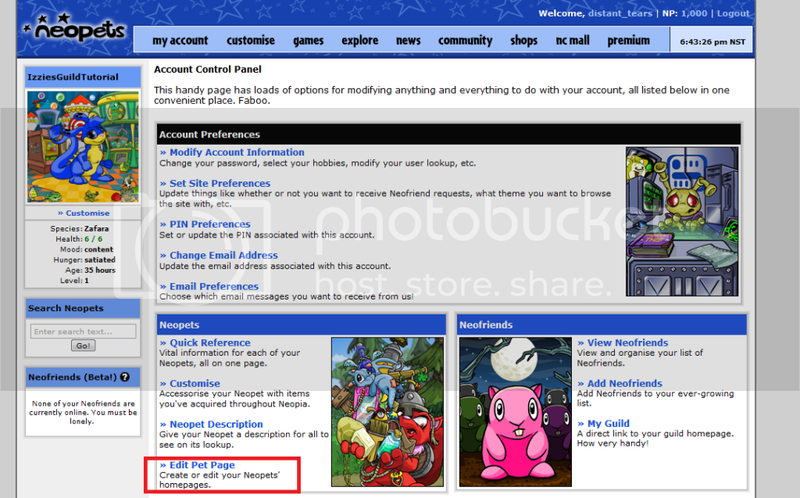 A petpage is located neopets.com/~PETNAME. People hold all sorts of things on petpages: graphics sites; blogs; tutorials; directories... The list is endless! The great thing about petpages is that you will never run out of space because there isn't a character limit. Are you new to coding? Here's the official Neopets.com HTML Guide. It's great for beginners to get a feel for what basic HTML can do. Want your guild to seem more established? Create a pet specifically to host your guild's webbie on. The pet's name should be similar to the guild's name. For instance, if my guild was named "The Poogle Lovers", I would consider naming my pet something along the lines of "Poogle_Lovers" or "ThePoogleLovers" or even "TPLWebbie". You may have heard people mention an anchored petpage or layout. On an anchored layout, you can have different "pages". For instance, the layout for this tutorial is anchored. When you click on a link, it takes you to what seems like a completely different page. 1.) Enlist (someone) in the armed forces. 2.) Form (an army or other force) by enlisting new people: "recruiting an army". But, we'll be using it in the sense that you want people to join your guild, so you're going to ask them to be in it politely. 2.) Advertise on boards that say "Guildless" or "Searching for a guild" in the title. The Majestics is looking for members! The Majestics: We want YOU! The next few posts would consist of me explaining what my guild was, how it worked, our different activities, and links to important pages (i.e. webbie, portal, guild home). Hey, NAME! I'm YOURNAME from YOURGUILD. YOURGUILD is a LITERACYLEVEL, THEME themed guild that has # fun and chatty members! We offer plenty of fun activities, such as ACTIVITY and ACTIVITY. ANOTHERFUNFACTABOUTGUILD! If you have any questions, feel free to neomail me! Hey, distant_tears! I'm Izzie from The Majestics. TM is a semi-lit, multi-themed guild that has 15 fun and chatty members! We offer plenty of fun activities, such as 1 neopoint auctions and weekly game challenges. A few of our themes include reading, writing, and games. Got a Q? Neomail me! Another type of advertising some guilds use would look like this. Below is one for The Majestics, because it would be hard to explain with just YOURGUILD and ACTIVITY, ACTIVITY, ACTIVITY. Everything you could ask for from a guild! Got a Q? Well, I've got an A! Just neomail me! The second advertising example takes less space on the boards, but it looks more fake. You look just like an average, boring old guild. You want to look unique and exciting while advertising. 1.) Never put a full link at the end of your post. If you do, your signature will disappear! If you have to put a link at the end, hit enter before submitting your post. 3.) Have a nice font. If you have a professional-looking font, people are more likely to take you seriously. Check under the Graphics section for a tutorial on making fonts. Alternately, you could go to the Avatars / NeoSignatures board and ask someone to make you one. 4.) Find out the recruitee's name. This can be done by going to their lookup and searching for their name, or by reading through their posts or signature. Sometimes, it's not there, and that's okay. But people love it when you address them by name; It makes them feel special. 1.) Stay active. This part is definitely the most important. To stay active, post regularly on the guild message boards. Chat with your members through neomail, ask them for ideas for the guild. Send out Guild Mailings (explained later in the tutorial) with updates about your guild. 2.) Keep your pages up to date. If your pages are old and outdated, it makes members think you don't care about the guild. It pushes them away if they need to neomail you about every little thing that's wrong. 3.) Follow through with your promises. If you promise your members 1 neopoint auctions, then you'd better put up some dang auctions or you've got an angry mob on your hands (Or, even worse, 1 member left. And that member is you.). Why should I have activities? Many guilds have activities to encourage their members to participate more often in the guild. A few of these activities include 1 neopoint auctions, guild trades, and avatar lending. Here is a lovely article in the Neopian Times if you don't like any of my ideas. And here is another one. 1.) Avatar Lending: This activity is easy to run. You buy basic avatar items, such as eight items with "Orange" in the name for the Orange avatar, and ten items with dung in the name for the I'm Smelly avatar. 2.) Guild Newspaper: Does you guild have a few writers in it? If the answer is yes, then this might be the activity for your guild. Put a petpage up and name it something newspaper-y. If you have a Glee guild, why not call it Gleek Weekly? A vampire guild? How about the Bitten Times? Have members submit questions, articles, poems, drawings... You name it! 4.) Decoration Contest: Have your members decorate their neohomes, and have members vote on their favorites. 5.) Pet Finder: Choose a neopet, i.e. baby uni or darigan skeith. 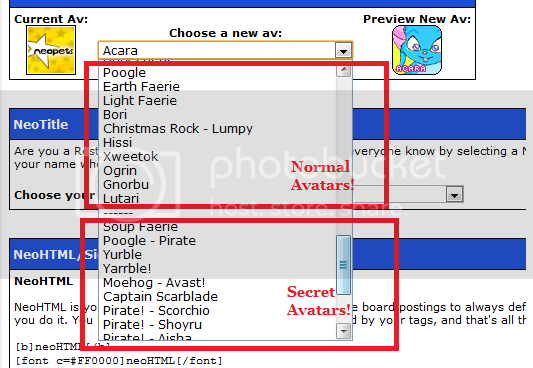 Have people search for a neopet with that colour and species and submit the pet names or links to the pet's lookup. Have your own idea that you think everyone should know about? Neomail it to Izzie with the subject "Guild Activity". A lot of guilds have a point system. Members can earn points by participating in guild activities, being active on the message boards, or hosting a page for the guild. Guilds offer different amounts of points for different things: Perhaps you could get a point per post, or maybe 5 points for participating in an activity. The points can be used in different ways: Some guilds use the points to rank up, other guilds use the points as a friendly competition between members or teams, and other guilds may use them other ways. Guild shops can be used to raise money for the guild, but... I don't quite understand why you would need a guild shop because prizes are not allowed. So I went and thought of some ways you could use your guild shop donations for. 2.) Just to say you have the money: People donating to your guild till is nice... And it'd be awesome to brag that your guild till is like 5 million neopoints. 3.) Fund 1 np auctions: Use the money to purchase codestones, bottled faeries, paint brushes, etc. and host them in your guild 1 np auctions! In my guild we have daily (or at least I try to) 1 np auctions so the guild shop definitly helps ALOT. Also we have free trades, I forgot to mention that. Oh I almost forgot the guild wishing well. People send a neomail of what they want, as long as it's not too expensive and the guild shop funds the wishes. Have an idea that isn't listed? Go ahead and neomail me the idea. Not sure what's allowed and what isn't allowed in guild activities? Go ahead and click here! There's a lot of controversy over what is allowed in guilds and what isn't. This is a little about what I have found to answer those questions. I hope it clears things up for you. Yes, please report the guild immediately. While players are allowed to donate to a guild, any guild demanding a "donation" or fee to enter or participate in it is very much breaking the rules (and spirit) of a guild. You are quite correct to think that this is against the rules. No one should be asked to leave the safety of Neopets, and certainly not by the council members of a guild! Feel free to inform them that you are uncomfortable breaking site rules and don't wish to receive a warning. We have rules in place for a reason. Ugh, please do. Tricking people into visiting a link is not allowed in addition to being in poor taste. Please feel free to report any shops, Pet pages or lookups doing so. The idea behind guilds is to have a private forum where like-minded people can chat and get to know each other and make friends. Contests, while many people consider them fun, are often used to scam, such as fake giveaways to the person who "donates the most Neopoints to the guild," etc. In order to insure a safe and happy Neopia for everyone, it is important that leaders and members of even honest guilds do not have guild contests. This whole page on Jellyneo is about guilds. I don't want to plagiarize, so I'll just let you go there on your own if you want to know more. Here are some tips for the more advanced options in your guild. Guild Council: Learn all about your guild council, sub-council, and your normal members. Admin Powers: Learn about admin powers, the responsibility the people that have them hold, and the basic functions of them. Guild Graphics and Fonts: How to create simple graphics and snazzy fonts. Private vs. Public: The pros and cons of a guild being private or public. ...And now you're to the more advanced regions of creating one. You've set up activities, your webbie, maybe even a portal. Members are starting to trickle in... So here are a few things you may need to know that have to do with guild council. Before we talk about guild council, we should talk about your Guild Hierarchy. Q: What is a Guild Hierarchy? A: A Guild Hierarchy is how you can set what rank your members are. If you view your lookup, it should say "Leader in (GuildName)". This is your ranking in the guild hierarchy. When someone joins your guild, their ranking will automatically be whatever is set as "Guild Member 5". You can manually change their rank... But we'll get to that later. What's your guild's theme? Think this over for a second. Now think of five ranks to fit your theme, from lowest to highest. This might take you awhile. I would talk it over with some of the members of the guild or the co-owner(s) to see what their opinions on it are. Please note that I just made these up, so they might not be the best examples. You can change the words however you want, but this is just an idea. You should come up with something creative for your guild hierarchy. In your guild, there are different jobs that need to be completed. 1.) Advertising: This is a big one. Check out the advertising tab on this tutorial for more information. 2.) Updating the Guild Homepage: This job just requires maybe five minutes of your (or whoever this job belongs to's) time each day tops. Just check for spelling errors, say whether or not you have new members, update the news, etc. 3.) Welcoming New Members: This should be everyone's job. If a new member posts on the messages, then everyone should say hi and introduce themselves. The council member(s) should friend the new member so they can participate in various events. 4.) Patrolling the Message Boards: This person's job is to make sure there is no drama, name calling, SPAM (short, pointless, annoying messages), or anything that is against your guild's rules (or Neopet's rules, for that matter) going on. If they see it happening, they will delete the message, give the member a warning (or block / suspend them depending on the number of offenses), or tell the guild leader and let them take care of it. Can you think of an important job that isn't listed here? Neomail me! You are automatically the first person in your guild council. Now the question is... Who will be the other four? Second (II) Council Position: This is the second highest ranking in the guild. This person should be someone you trust (your co-owner if you have one). They should be able to pull their own weight and help keep the guild up-to-date. Third (III) Council Position: The third highest ranking in the guild. Most guilds will wait until they have 15 or 20 members to fill this position. Fourth (IV) Council Position: The fourth highest ranking in your guild. Successful guilds will wait until they have thirty or so members to fill this spot. Different guilds wait for different reasons. Some wait because they can handle that many members, activities, etc. Some wait because an open council position is a good advertiser. Fifth (V) Council Position: This is the lowest highest ranking in your guild... Or to put it more clearly, the fifth highest. Please note that everybody in a council position should be trustworthy. If you don't trust them to do their job, then they shouldn't be there. When someone applies for a position, they should include what services they can offer to the guild. Many guilds have a sub-council. The sub-council members get put on Guild Member Rank 1, and they have a certain admin privilege or job they are supposed to do. There can be unlimited sub-council members. What are admin powers? How do I get them? How do I give them to other people? Well, I'm here to answer all of those questions... And a few more. Because this section is extremely long, I split the different admin powers onto their own pages (excluding Guild Council, Board, and Log. These share due to them being very simple, and therefore there is little information to tell). Here are links to all of the pages, listed in "official" order (the order they are when you're on your guild). Admin powers give you the power to edit your guild. One of them lets you edit the layout, another lets you edit your guild poll, and another gives you the option to change your members' ranks. Keep in mind that you shouldn't give every member admin power, and almost no member except for yourself should have all of the admin powers unless you have a co-owner. Here is a list of the admin and what each one does. Layout Control: Gives the member the power to edit all four options under layout. Board Monitor: Gives the member the power to delete member posts on the message boards. Invite Privilege: Lets the member invite people to the guild. Member Admin: Gives the member the ability to give other members admin powers. Calendar Monitor: The member can delete events from the calendar. Mail Privilege: Lets the member send a Guild Mailing. Council Admin: The member can decide who is on the council and see applications. 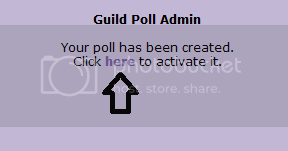 Poll Admin: Allows the member to change the guild poll. Log Admin: The member can delete things off of the guild log. Quit Leadership: This gives the leadership of the guild to the second in command. Only the guild leader has this option. Delete Guild: This deletes the guild. To use this admin, you must delete every member from the guild. Only the guild leader has this option. Where can I find admin powers? Well, I can't really explain it, so here's a screenie for you! This section lets you change your guild's layout, name, description, color scheme, decide whether or not invitation should be restricted to admin privilege, and whether or not your guild should be private. Most of this is self-explanatory or there is a description provided underneath the option. If you need coding help on your guild layout, please go here (the Help Chat) or here (the Guild Chat). I cannot help you with this, so don't ask me! This is how you change your guild hierarchy. Not sure what that is? Click here. To change your guild hierarchy, know this: It's listed from highest rank to lowest rank. The first one you see (Guild Council 1) is you (or the guild leader if you just happen to have layout admin. In which case, congratulations!). The last one you see (Guild Member 5) is the rank people are when they join your guild. Your Guild Keywords are how people search your guild from the main guild page. You can have up to 5 keywords. I suggest making one of your keywords your guild name and one of them your guild theme and/or sub-theme. The rest are up to you. Look in the upper left-hand corner of your guild. See the little [Logo Here] sign? That's how you change it! The graphic must be 100x100 pixels and either .gif or .jpg, so be careful how you save it after you create it. Under "Guild Members", you can edit everything about... You guessed it. Your guild members. Don't get this confused with "Members" under Options! The "Guild Members" section lets you edit members, but the "Members" section takes you to your member's look up. This really confused me when I was first starting out. See the number one, up by my name? Well, this describes it. The little blue star by the number one and my username indicates that I have admin privileges. See the number 2? (Thanks Angell for letting me use you as an example.) There's no star. That means that this member does not have admin privileges. You may be wondering what a few of the other things are. I'll explain them here. Name: This shows all of your members' usernames. Rank: What rank the member is in the guild. Posts: How many times the member has posted. Active: Last date that the member logged on. Status: Whether the member is frozen, active, or banned from the guild. Joined: What date the member joined the guild. What happens when you choose a member? 1.) Rank: This is how you change your member's rank. Click the drop-down list, and then select which rank you want them to be. The ones at the top are the lowest ranks and the ones at the bottom. 2.) Suspend Member: To ban the member from the guild. This means they can't post any messages. 3.) Delete Member: Erase the member from your guild. 4.) Block Member (permanently): This erases the member from your guild forever. Wield this power carefully! 5.) Admin Powers: This is how you give other members admin powers. Check the box by the admin you wish to give them. To make "Invite Privilege" an admin option, enable it from the "Edit Layout" page. To give them all admin, hit the check mark. To take away all admin, hit the blank box. 6.) Update Member: Save your changes. You can only edit one thing at a time. Some of that isn't showing up! This admin power lets your guild member decide who is on the guild council. They can approve the applications people submit. This could be helpful if it's too big of a task for you to handle alone. The member with the admin could help delete the spam ones that newbies submit, or give you feedback on a really good application. If you give a member this admin power, it lets them delete messages off of the guild board manually. They can also delete messages from one certain member, and messages after a certain day (i.e. "Before Yesterday" or "Before Three Days Ago"). Guild Log is a very simple admin power. Your guild log basically keeps track of who uses what admin in the guild. If someone changes something, it's recorded in your guild log. Anyway, guild log admin lets the member delete things from the guild log. Simple as that! The guild poll is always fascinating to new guild owners. Most people will put up a random poll that has nothing to do with the guild. Here I'll include a few screenies of how to make a poll. A poll is a list of choices that your members can vote on. You can see how many people voted on each selection, but not who voted on what. What should my poll be? Honestly, this is up to you. If it was me, I would make the poll something that you honestly want to know or something that the guild really needs to know. "Can you make layouts?" or "Should we have a guild mall?" would be good ones. 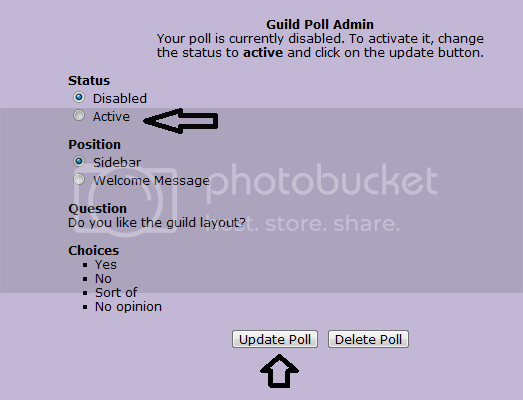 Make sure that you keep you guild poll updated! Don't leave the same on up for three months. 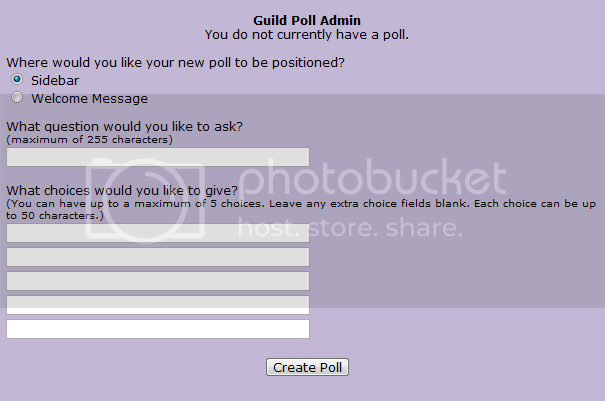 First, click "Guild Poll" under the admin section of your guild. Then, either delete the poll you currently have or just go ahead and enter your choices. Click create poll. Click where it says "here". Then, change the status to "active" and decide whether you want it to show in the sidebar (between Guild Stats and Options) or in the welcome message. If you choose welcome message, it will probably mess up your layout or just not show at all. You have completed the whole admin section! Congrats! The admin section of IGT is definitely the longest and most in depth part of the tutorial. Parts of it are hard to understand, because some of it is just confusing! Anyway, you completed it, and hopefully understand it. If you're confused, please contact me and I can answer your questions. Although I can't make graphics, here (The Shelf Directory) is a list of a ton of guides. The ones with blue stars by them have good, quality information. Creating a Font: Make your own font from scratch. I explain step-by-step how to do it, including screenies and describing the coding. Font Tips: Some expert font tips that I use on my fonts. Here are just a few font tips that will make your font even better! #1: Use the colors on your avatar. Sunnyneo has a great little tool for this: An avatar eyedropper. First, you select your browser, then choose which avatar you're using. Move the cursor over the avatar, then click. Adjust the arrows, then select "Get Pixel Color". This will give you the Hexidecimal code for that color. #2: Get rid of that siggy line! This sounds like it takes a lot of work, but really it doesn't! You just put a square bracket ( [ ) at the end of the first line, then another one ( ] ) at the beginning of the second line. Tada! No more line. #3: Don't use overly bright colors. I'm not saying I hate bright colors; I'm just saying that... Well, if your font is bright yellow, I might be getting a headache from talking to you. #4: Don't make your main font size 4. The reason for this? It makes you look immature. Choose font size 1 or 2 for your main writing, and then make your signature size four. If you use a font like cursive or vivaldi on your main writing, people won't be able to read it very well. Here you can learn how to make a font. To change your font, click here. If you haven't done anything at all with your font, it'll look like this. To change your avatar, click the dropdown list. Choose the avatar for a preview. You'll want to choose a NeoTitle that matches your avatar. My image didn't save for this one, sorry. Now your font should look something like this. [fontc=#hexidecimalcode: This changes the color of your font. A Hexidecimal code is the sting of numbers and letters that is used to tell the coding what color you want it to be! s=1-4: This is the size your text will be. You can make it a number from 1 to 4. 1 is the smallest size and 4 is the largest. f=fontface: This changes what your text looks like. On the NeoBoards, it has to be a one-word font face (or typeface). A few that I like to use are: Georgia, Impact, and Verdana. [/font]: This shows that that section of the font should stop right there. To change your NeoSignature (What's above and below your main text), follow these steps. Insert this again, but this time before your previous one. Your font should look like this now. Now, put this in the second box. Take out those pesky siggy lines! See those black lines inbetween your NeoHTML and your signature? We're going to take those out, and it's super simple. You just made a font! A big question for new guild owners is whether your guild should be private or public. There are pros and cons for each choice, and in the end it's your choice as to which your guild will be. I'm just here to inform you about them! Having a private guild has it perks... And its put-downs. -People see your guild as "exclusive", which draws them in. -You can keep your links more secret. That way, people can't steal your layouts, ideas, etc. You can have a page just for people looking to join, then have the other guild links seperate from that page. 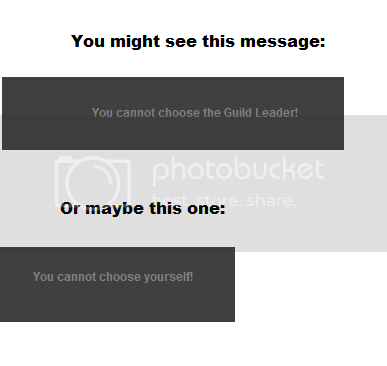 -People can't view your guild's homepage without an invitation to the guild. This may drive some people away because they can't view your layout. -Some people may feel excluded because your guild is private, therefore not including them. -If you turn away a member, they might get angry with you and you could start getting rude mails from them. Having a public guild can be great, or make you feel as grey as a pet. -You may get more members because people see you as open and friendly. -It's easy to advertise a public guild. -Anyone can join. This means you could get a totally obnoxious or rude member in your guild. -If you kick someone out, they can just rejoin your guild again and again (until you use your admin power to its fullest and permanently delete them from the guild. Do you want to be affiliated to Izzie's Guild Tutorial? Just neomail me and ask! Don't want to show our button? Well, how about creating a board for us? It's not required, but very appreciated! (http://www.neopets.com/~IzziesGuildTutorial) Izzie's Guild Tutorial is run by Izzie, or starslightatnight. It's designed to help new or established guild owners make their guilds even better. It covers topics such as how to start a guild, different activities, and recruiting members, and much more! Feel free to bump this board, but refrain from posting any ads. Thank you!